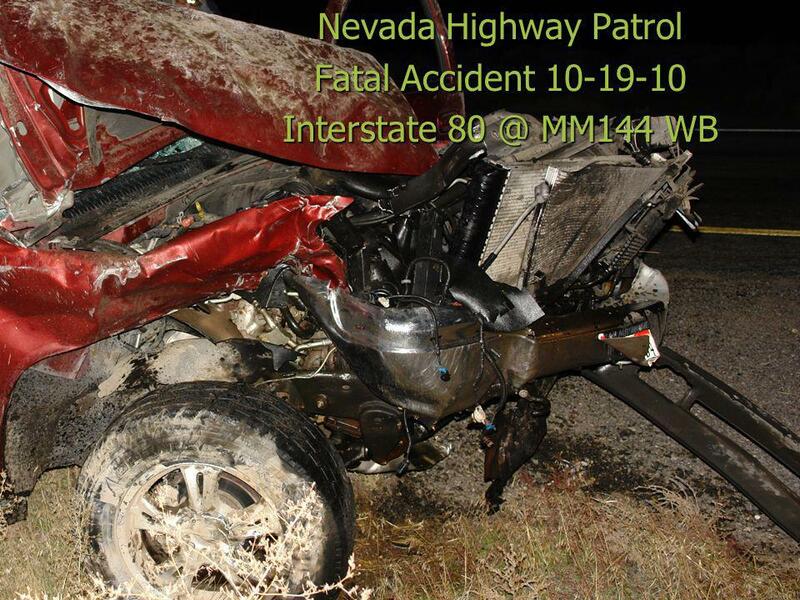 Nevada Highway Patrol Fatal Accident 10-19-10 Interstate MM144 WB. 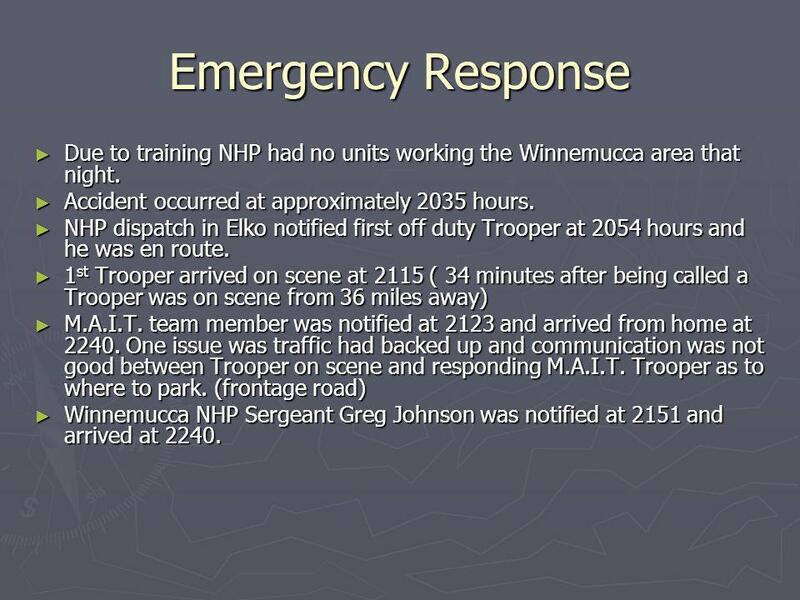 3 Emergency Response Due to training NHP had no units working the Winnemucca area that night. Due to training NHP had no units working the Winnemucca area that night. Accident occurred at approximately 2035 hours. Accident occurred at approximately 2035 hours. NHP dispatch in Elko notified first off duty Trooper at 2054 hours and he was en route. NHP dispatch in Elko notified first off duty Trooper at 2054 hours and he was en route. 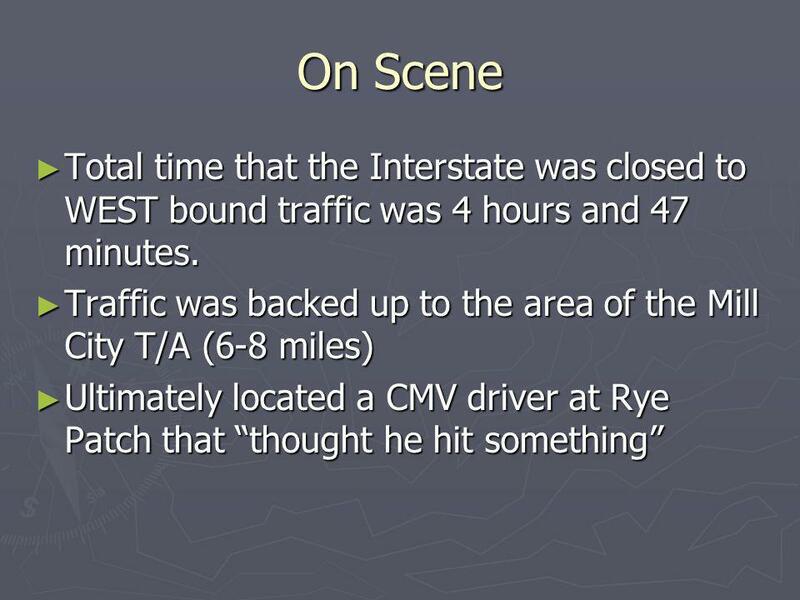 1 st Trooper arrived on scene at 2115 ( 34 minutes after being called a Trooper was on scene from 36 miles away) 1 st Trooper arrived on scene at 2115 ( 34 minutes after being called a Trooper was on scene from 36 miles away) M.A.I.T. team member was notified at 2123 and arrived from home at 2240. One issue was traffic had backed up and communication was not good between Trooper on scene and responding M.A.I.T. Trooper as to where to park. (frontage road) M.A.I.T. team member was notified at 2123 and arrived from home at 2240. One issue was traffic had backed up and communication was not good between Trooper on scene and responding M.A.I.T. Trooper as to where to park. 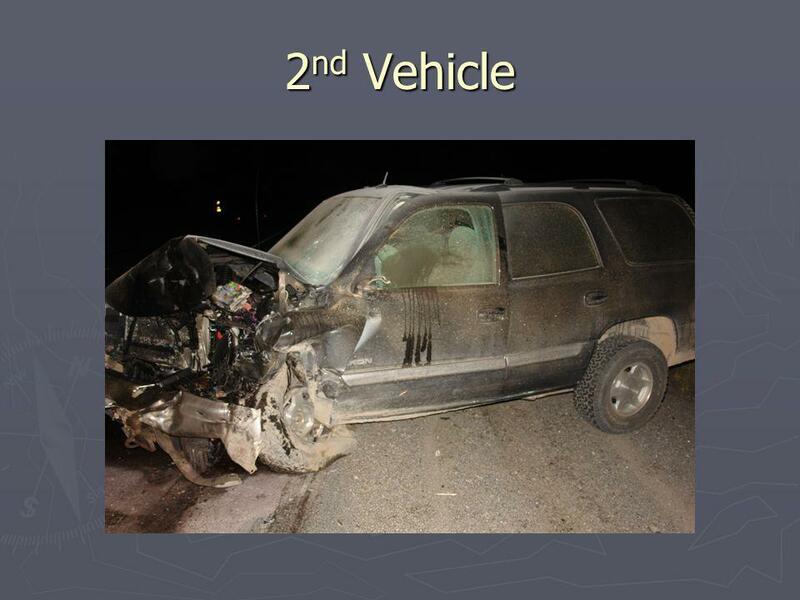 (frontage road) Winnemucca NHP Sergeant Greg Johnson was notified at 2151 and arrived at 2240. Winnemucca NHP Sergeant Greg Johnson was notified at 2151 and arrived at 2240. 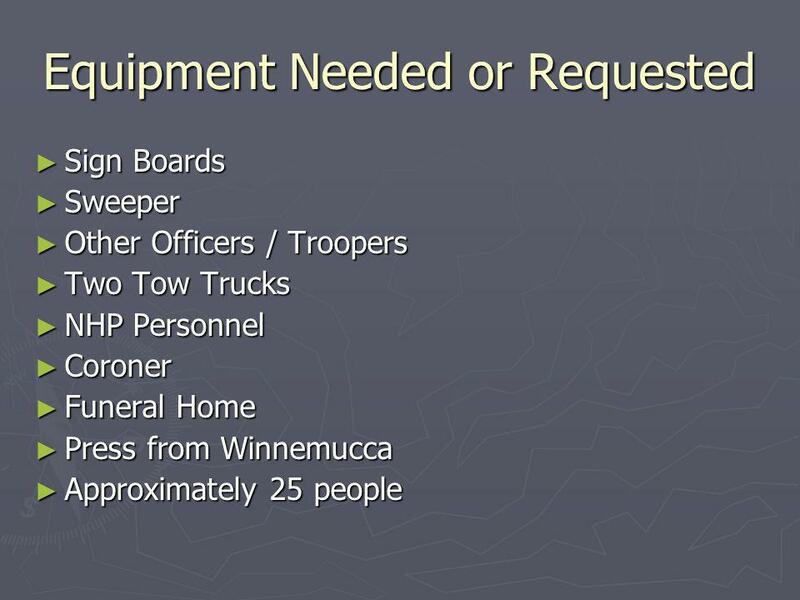 4 Emergency Response Cont. 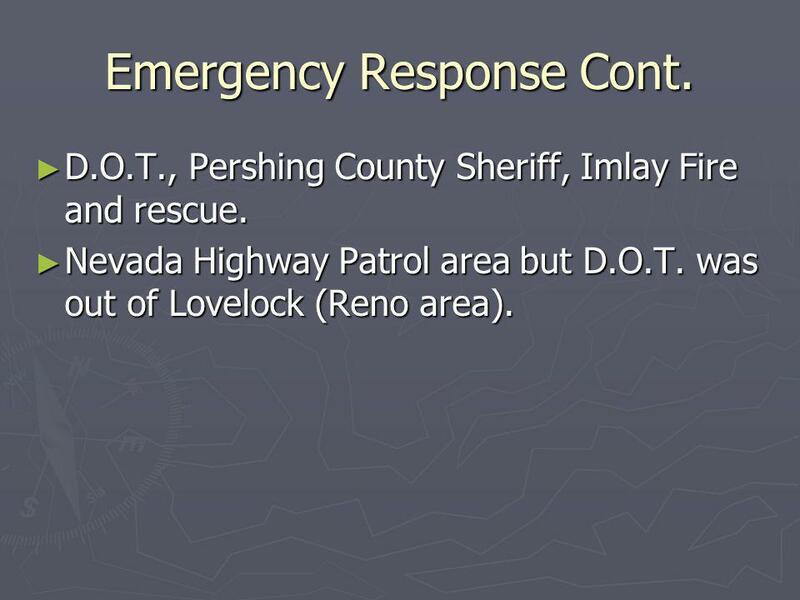 D.O.T., Pershing County Sheriff, Imlay Fire and rescue. D.O.T., Pershing County Sheriff, Imlay Fire and rescue. Nevada Highway Patrol area but D.O.T. was out of Lovelock (Reno area). Nevada Highway Patrol area but D.O.T. was out of Lovelock (Reno area). 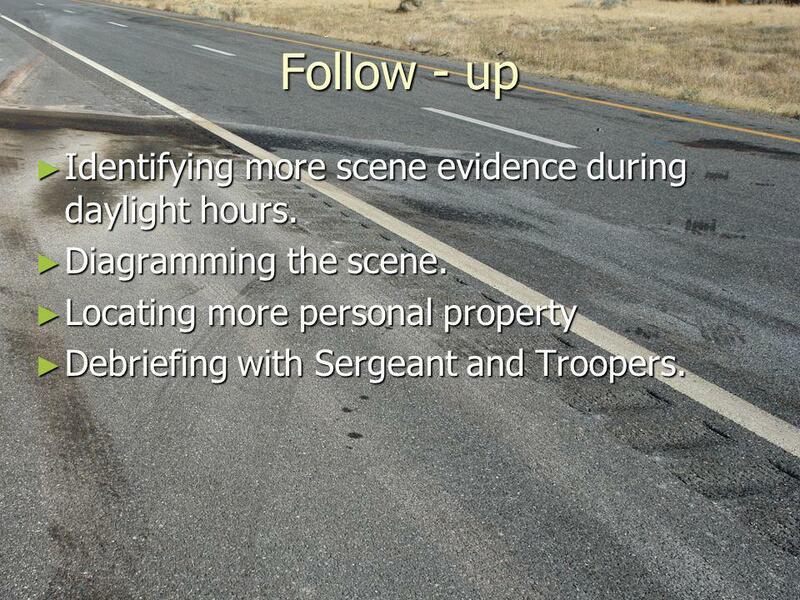 9 Follow - up Identifying more scene evidence during daylight hours. Identifying more scene evidence during daylight hours. Diagramming the scene. Diagramming the scene. Locating more personal property Locating more personal property Debriefing with Sergeant and Troopers. Debriefing with Sergeant and Troopers. 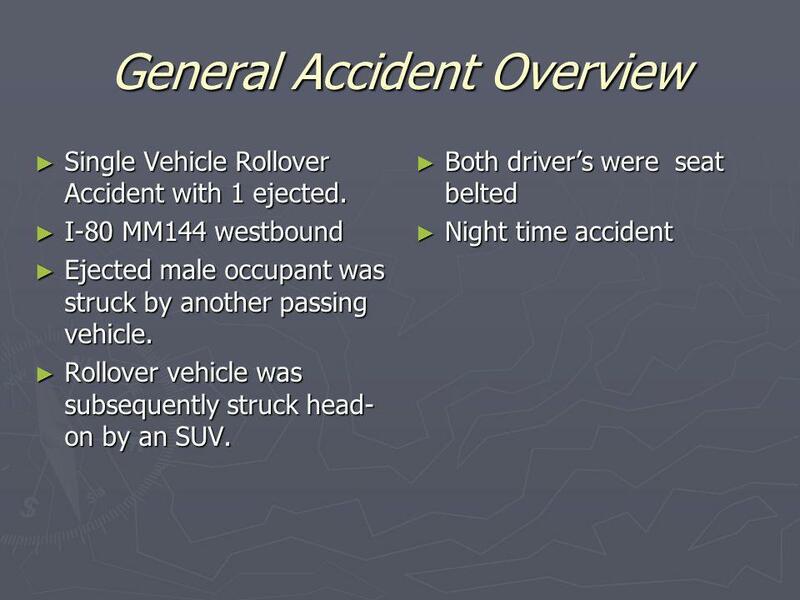 Download ppt "Nevada Highway Patrol Fatal Accident 10-19-10 Interstate MM144 WB." Southwest Safety Training Alliance Inc.
ILLINOIS DEPARTMENT OF TRANSPORTATION Improving Safety For Incident Responders Illinois Department of Transportation Update: December, 2012 Highway Incident. KYTC District 6 “Great Eight” Incident Management Task Force January 14, 2014.  Definition  Goals  Elements  Roles and Responsibilities  Accomplishments. Law Enforcement LODDs May, 2011-Police Officer Kevin Will was struck and killed as he investigated a hit-and-run accident in Houston, TX. The driver drove. Ohio Quick Clear Committee AAA Ohio Buckeye State Sheriff’s Association Ohio Association of Chiefs of Police Ohio Department of Public Safety Ohio Department. Presentation provided by the Volusia County Fire Chief’s Training Committee. Ohio QuickClear TIM Training subtitle. QuickClear Committee AAA Ohio Buckeye State Sheriff’s Association Ohio Association of Chiefs of Police Ohio Department. Lt. Lee S. Bailey September 19, 2013 Richmond, VA.
Highway Safety How do we get there? 43, Projected U.S. Highway Fatalities. CALIFORNIA HIGHWAY PATROL Presentation to Fresno County Board of Supervisors March 4, 2008 Chief Scott MacGregor. 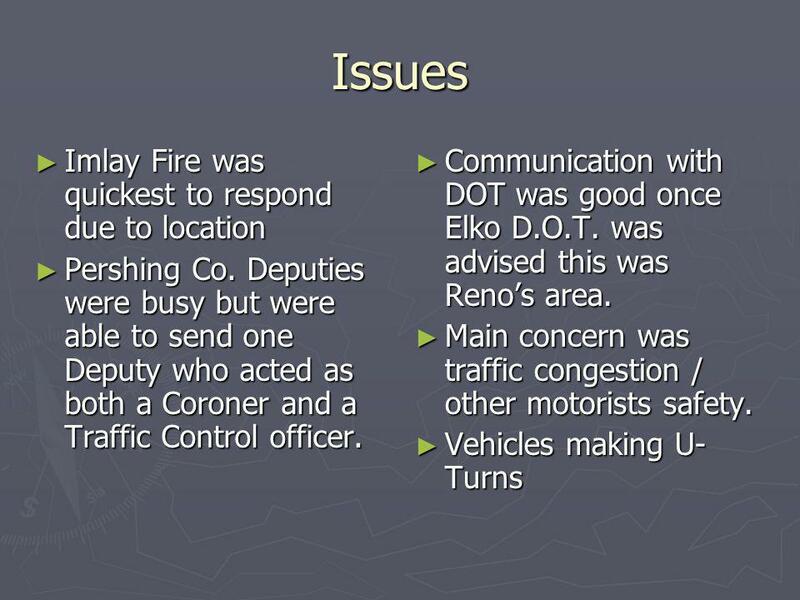 Getting Results from Regional Traffic Incident Management Teams Southwest Florida T I M Teams Collier - Lee - Charlotte and Sarasota - Manatee.